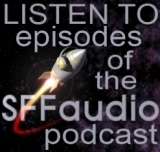 The SFFaudio Podcast #071 – Jesse and Scott talk with audio dramatist George Zarr! George Zarr of Seeing Ear Theatre fame, SciFi.com (aka Syfy.com), Brian Smith, John Colluci, RealAudio, NPR, Satellite Radio, “doing your laundry by flushing it down a toilet”, seeing the power of a budget, what audio drama should be and how you should do it, Zippr, the most common error people make on their scripts, adapt first, the baby analogy, how Seeing Ear Theatre worked, Andrew Joffe, Tony Daniel, writing and casting, “I’ll do the Canadian accent eh?”, experimental, Too Late An Experiment In Sound, National Audio Theatre Festivals, Meet The Neighbor, silent pictures for radio, teaching audio drama Columbia College Chicago, a textbook for audio drama, the three building blocks for audio drama (voice, sound effects and music), the Swedish rule, Babylon Wisconsin, adapting short stories to audio drama, tips for writing with kids, the 10,000 bad drawings inside me, writing original stories vs. adapting existing ones (for audio drama), narration in audio drama, A Good Knight’s Work adapted from the story by Robert Bloch, Sherman Oaks, California, Tony Danza, Simon Jones, “Brooklyn vs. Eaton”, John Ritter, Henry Winkler, Sirius Satellite Radio, Three’s Company, Snow Glass Apples by Neil Gaiman, Murder Mysteries by Neil Gaiman, Two Plays For Voices |READ OUR REVIEW|, Dove Audio, Bebe Neuwirth, Brian Dennehy, The Omen IV, Voices In The Wind, Every Now And Then, School Spirit, recording live, David Farquhar, Jake Sampson: Monster Hunter, Tales Of The Gold Monkey, Indiana Jones and The Mummy, Splendid Your Honor, Vlad Tepes: Dracula by Tamora Pierce, The Adventures Of Sexton Blake |READ OUR REVIEW|, Sarah Montague, WNYC, Marcie Mancotti, Barbara Rosenblat, Small Town by Lawrence Block, The Moon Moth adapted from the story by Jack Vance, X-Minus One Project, LibriVox.org, copyright and public domain, adapting Science Fiction, Time In Advance by William Tenn, Child’s Play, Kindred, adapting longer materials (novels), making a sequel to a classic audio drama, Sorry Wrong Number, Jumping Niagara Falls, murder never smelled so good, Fred Greenhalgh and field recorded audio drama, zombies work well as audio drama, Tales From The Crypt |READ OUR REVIEW|, J. Michael Straczynski’s City Of Dreams, the campaign to get CBC to release The Adventures Of Apocalypse Al, EC Comics, By The Fright Of The Silvery Moon, Don Knotts, Don Knotts as a guest on Scooby Doo, Fare Tonight Followed By Increasing Clottiness, Keith David, Aasif Mandvi, The Daily Show with Jon Stewart, vampires, van Helsing, Campbell Scott, Carrion Death, This Trick’ll Kill You (the never released on CD episode of Tales From The Crypt), H.G. Well’s The Time Machine adapted by Charles Potter, Humphrey Bogart, Lux Radio Theatre, The Death Of Captain Future based on the story by Allen Steele, Marina Sirtis. So by episode #70, you mean episode #71. :) This show makes me want to download all the audiodramas to my iphone, but I need to get home to get the right library number, so I can sync.